There are many classes of fire extinguishers and choosing the right one is critical in effectively combating fire. Fire extinguishers are labeled with class codes that tell you what types of fires a specific fire extinguisher is effective against. Class A fire extinguishers are effective against paper, wood, textiles, and plastics. Class B fire extinguishers are best for flammable liquid fires including gasoline, paint, oil, and cooking liquids. 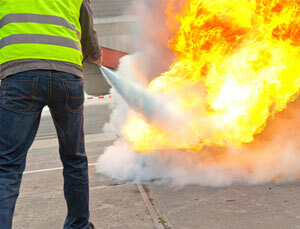 Class C fire extinguishers are best for fires involving live electrical equipment. Make sure to choose one that will be effective in fighting fires based on the materials in your location and environment.